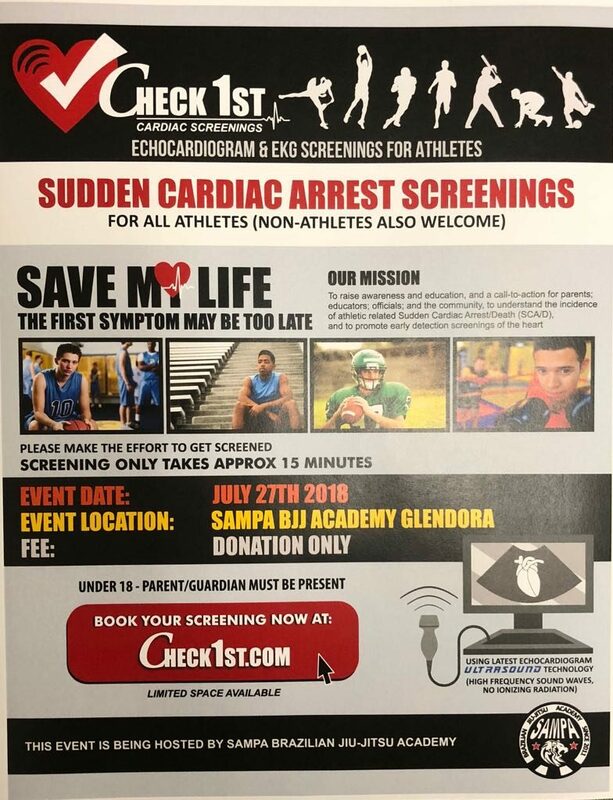 I was approached last week by a group of amazing people that are working hard on keeping our kids/teens safe and avoid sudden cardiac failure. Dr. Saleem needed a place where this event could be held and we decided to donate one of our rooms for a couple of hours so anyone could come and get their heart screened for a very low cost or better saying a donation. The event will be held Friday 7/27 from 8 am to 4 pm at Sampa BJJ – 903 East Route 66 – Glendora. Sampa is not sponsoring the event neither has contracted the professionals that will be working on the screenings, Sampa Jiu Jitsu had only donate it space so the community could take advantage of such a great opportunity.